Let’s start the weekend off with a 100% Amsterdam based line-up, but not just any line-up. MELON, David Labeij, William Kouam Djoko, Miss Melera, Camiel Daamen & Michiel Tettero are all on the bill for this Friday’s Ondertoon at the H7 Loods. Most of the best parties I’ve ever been to have taken place at an industrial warehouse like the one for this event, until 7 o’clock in the morning. Get your energizers together ’cause this is gonna be another hell of a weekend Amsterdam. Schmeck Pony is throwing a party on Friday to celebrate this guy called Kees. This Kees guy appears to be a real showman, therefore Schmeck Pony named their event ‘Showkees’. Genius. Doesn’t even matter who’s playing, these concepts usually work out fine. In case you do care about the line-up: Dosem B2B Christian Smith (wow! ), Erick Eerdhuizen, Trish Former Friends, Erik Sebastiaan, Disco Evert & Bovenste Plank. Chicago Social Club is all yours this Friday. After that, continue to rave at Club Home at their afterparty featuring Christian Smith, Boris Werner, Homework, Rauwkost, Hauk ‘n Baum, Brand and Trish Former Friends. I’m broke already, and it’s just the start of the weekend. 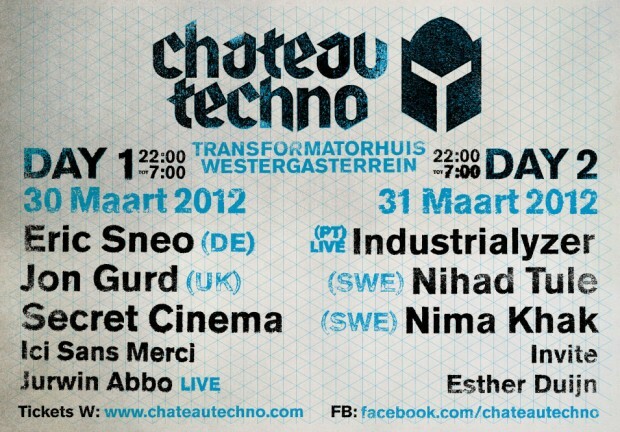 “Amsterdam’s fastest growing techno concept is back, and once again bigger than ever before. The knights of Chateau Techno have claimed a new building to use as their party castle and this time it’s the very beautiful and raw Transformatorhuis. And not just for one night until 7am, they’ve gone for a weekender: day one is called ‘medium’ power, but only compared to day two’s ‘full power’ violence. Expect lasers, smoke, fire and a huge sound system!” Read all about the line-up and more in our previous article about this two day warehouse party. Celebrating 7 incredible years of ongoing excitement at Sugar Factory, Curious Behavior is back with an XL edition. What to expect? Private performances, birthday parties, private poetry, welcome committees, artists like Tom Trago, Daniel Zuur, Carlos Valdes & surprise performances by Florian Wolff and much more. We at Overdose fully support events featuring more than just hot DJs from Berlin, UK or USA and Funktion 1 soundsystems, so go visit Sugar Factory if you’re into more than that! They did their first party in 2007 and never thought they’d make it as far as they did today. This weekend they’re turning 5 years old and of course, this has to be celebrated properly. The first two nights have been sold out for a while, but the last night still has some tickets available. I don’t understand this because one of the top artists of 2011 is coming to town for this closing event: Todd Terje. Supported by Rahaan, Antal vs San Proper & Casper Tielrooij, this should provide you with an epic Monday hangover. Cheers to that Amsterdam.